Over the last 10 years, Tosh, Andy and I have talked repeatedly about doing a skydive. But somehow we never progressed further; there always seemed to be something happening that meant we never managed to get it booked. During a get-together in early July, I raised the subject again with both Tosh and Andy. Unfortunately, Andy had not long returned from Sweden and as well as working very long hours, he was also in the process of buying a house. These commitments meant he was unable to join us, so reluctantly he had to pass. My 40th birthday was fast approaching and Tosh and I decided it was time to take the plunge (especially when we learned that I would have to go through the hassle of organising a medical certificate if I wanted to jump after I turned 40). The first thing to do was get in touch with a skydiving school and following a quick search on the web, I got in touch with a company called: Tandem Jump who were advertising a quite impressive list of jump sites. I gave them a call and got them to send out an info pack, which duly arrived a couple of days later. The info pack was impressive; it contained application forms from the British Parachute Association, along with a list of options, sites and prices. It also included a 20-minute DVD which was guaranteed to get the adrenaline pumping. A quick call to Tosh followed and we decided to do our jump from the Redlands Airfield, just down the road a bit from Swindon in Wiltshire. We elected to do the more expensive tandem jump for a couple of reasons; firstly, it required the least initial training and second because we wanted the experience of our first jump to be all about the sensation of falling and flying - not about trying to remember a large number of instructions, rules and techniques. 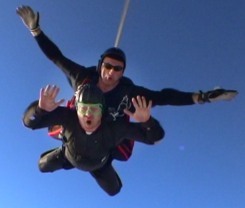 The tandem jump cost us £230 each (but we only had to pay an initial £50 non-refundable deposit to secure our places). With the booking done, I settled back into my daily routine and tried not to dwell too much on what I'd agreed to do. I'm not someone who has any real fear of heights but I'll admit that the thought of a 10,000-foot drop made my anxiety butterflies flutter. As the days ticked by, the anxiety gave way to excitement and by the time Tosh arrived at my place on Friday night, I could hardly wait! Saturday morning dawned cloudy with gusty winds and I anxiously checked the weather forecast over Redlands Airfield. It was touch-and-go, but there was no way we were pulling out! We headed out to Redlands around 11:00, arriving shortly after midday at this small but well-equipped airfield. After registering and settling up (including an extra £95 each to have the jump professionally filmed), we kicked back to wait for a break in the weather. Around 1pm we gathered with other students to begin our 20-minute pre-jump briefing. The instructor who gave the briefing was an open and friendly chap by the name of Andy Montriuo, who immediately put everyone at their ease with his obvious enthusiasm and sense of humour, before going through the safety procedures and giving useful hints and tips to help make the whole experience as enjoyable as possible. By now both Tosh and I were nicely wired ... all we wanted to do was jump. Unfortunately, the weather had other ideas. For the next 4½ hours we sat outside the airfield hangar watching bank after bank of cloud roll in...with the wind gusting over the 20mph safety mark (every time the wind gusts over 20mph jump time goes into an automatic 30 minute hold). A little after 5pm, Bruce - one of the instructors gathered us all into a huddle to explain the situation; winds were continuing to gust over 20mph and a phone call to two nearby airfields indicated more of the same was on the way. The instructors intended to hang out till the bitter end at 7pm on the off-chance of getting a small jump window. We were welcome to continue waiting patiently or we could re-schedule our jump for another day. The following day's forecast was not looking too good either, so Tosh and I decided to stick it out. And we were pretty much the only ones that did! Time ticked slowly by. We watched a group of students working through their RAPS course training, under the watchful eye of two instructors, asked questions and chatted. Then something strange happened...there was a subtle change in atmosphere; conversations died down and people huddled together in the office looking at screens. I think both Tosh and I held our breath...then the next thing I knew we were getting kitted up. Just about 6:45pm, we settled into the back of the aircraft, positioned directly in front of our respective instructors ("as close as two heterosexual men ever care to get", jokes one of the instructors). The pilot gunned the engine and moments later we were airborne. The land fell away from us and we headed into the blue...and past the point of no return. The door slides back and we start to shuffle into jump mode; Tosh's photographer is first out the door ... easing his way into position outside the aircraft so he can film Tosh's jump. He wears a specially-built helmet which has housings for both video and still cameras - and today he is using both. From the right side of this helmet, a wire runs to a switch which the photographer clamps between his teeth. The helmet has an eyepiece which sits directly in front of his right eye. Everything he sees through the eyepiece is seen by the camera. He nods to Tosh's instructor (who we later discovered is part of the Red Devil's display team!) and it's game on! Tosh and his instructor shuffle to the door. Tosh positions his legs, crosses his arms over his chest (taking hold of his harness), arches his back to push his weight forward and tips his head back (so the camera can see his face *). Then all three of them drop into the void. We fall for about 27 seconds (even though it only felt like about 5) and Andy deploys the the chute. Immediately the roaring sound in my ears ceases and I can clearly hear Andy taking to me. We slow to what feels like a complete stop for a split second and then we drop again ... but slower now. Andy manoeuvres the chute so we are facing directly away from the airfield. He then says something about air currents which I can hear clearly, but my mind is still reeling from the drop and I just nod dumbly, unable to comprehend what he is saying. Then the next thing I know, my hands are in the steering loops and Andy is banking to the right by drawing the right hand steering cable towards him. We go into a spiral turn which sends my head spinning before releasing the cable and I make a feeble attempt to redress balance out. The ground came steadily closer as we rode the air currents in a large arc to approach the landing field from the far side. 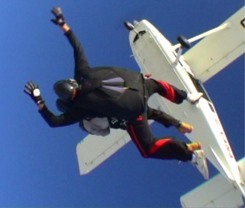 I lift my legs, ready for the moment of impact and a second later we were safely on the ground. Two minutes later, Tosh and his instructor land a little less than 30 yards away. He has the same look of stunned disbelief on his face that I'm sure I have on mine ...INCREDIBLE EXPERIENCE! Once we've had a chance to collect our wits, we walk back to the hangar (still floating on a cushion of air, high on the adrenaline. By now most folks have left and only the hard-core remain. They are obviously familiar with the stunned looks of amazement from first-timers and they offer words of congratulations and encouragement. One talks about how it's taken over his life since he first jumped a little over 18 months ago. Another talks about how each jump gets better and better. I can see what they mean. We took a photo or two and then said our goodbyes. We found ourselves already talking about doing a second tandem jump ... but this time with Andy too. Tosh turns puts a Nirvana album in his CD player and we cruise back to Basingstoke, still buzzing from the experience of a lifetime. What else can I say? This is quite simply the ultimate rush and even a full 5-bandanna rating doesn't come close to doing the whole experience justice! More Photos available: Visit the Skydiving 2006 Photo Gallery! * As a student of Jujutsu I suspect that tipping the students head back also alters the student's sense of balance a little, which prepares the student for the drop. As an added benefit, it allows the instructor to have better control of the student at the point where they leave the plane. Clever.